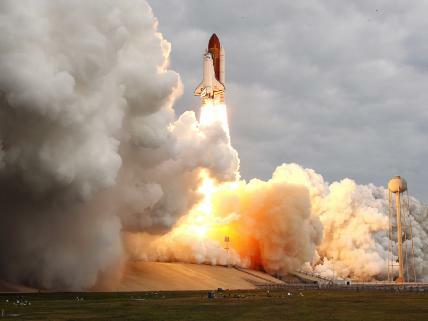 The penultimate Space Shuttle mission, STS-134, began this morning as the shuttle Endeavor blasted into orbit this morning at a few minutes before 6AM PDT. As usual, I was planning to be up and watching the launch via spaceflightnow.com, but their site seemed to be experiencing difficulties. Perhaps they could not handle the load? Plan B was to go directly to the source, nasa.gov and navigate my way to NASA TV. As I tuned in and full screened the video feed, I saw that I arrived just in time. There were only 30 seconds left on the countdown clock! I knew right away that it wasn't going to be a picture perfect launch. Lots of low clouds were covering the Florida sky. The launch went without a hitch, as far as I could tell, and within minutes, they were down range hundreds of miles, on their way to low earth orbit, and the ISS. Over the next two weeks of the mission, I plan to monitor events as closely as I can. It's exciting stuff, and it's really too bad, a shame, really, that it will really end this year. The San Jose Astronomical Association (SJAA) yesterday held its thirtieth annual astronomy equipment auction. As a board member, I participated, actually worked the event. It was amazing the amount of people that showed up. The Hall at Houge Park was filled with people and lots of gear. For the hour and more before the bidding commenced, people were milling about, checking out what would be up for bid, talking with old friends and catching up, or working on registering their items for sale. Orion Telescopes donated a lot of stuff, so registering their items took some time, actually it made us start 30 minutes late. But we can't fault them over their generosity. We seemed to get off to a slow start. We started with a few telescopes that the club was trying to move, but no one seemed interested. Things finally got going once we started working on the small meteorites that someone had packaged up, with descriptions, into small plastic baggies. They were going for anywhere from $5 to $25 for starting bids, and went up from there. All manner of instruments and implements were available. From entire quality telescopes to pieces are parts were available for the bidding. There was even a home made water color of recent comet McNaught, nicely framed. The event was supposed to start at noon for registration and go to about 4 or 5PM. But due to the amount of items, we actually ended just before 8PM! Some folks with prior engagements for the evening were pressing for us to take a break so they could settle up and be on their way. So we finally, around 5PM, do just that. We asked those folks who bought or sold something, and who had to go, to come to the table and settle up. That didn't work out so well because some folks didin't get the message, and stood in line to settle up even though they intended to stay and bid or sell some more. In the end, it was a long day, and I need to extend thanks and gratitude to my family who were expecting me to come home hours sooner. I was expecting a much chillier reception, but I tried to stay in touch and relay the status, so perhaps that helped. We, the Board, already have ideas for improvement for next year. The next board meeting at the end of May will see a sort of post mortem about the auction, where we will document what went wrong, and how we can improve. Should be fun! The SJAA General Meeting we held last Saturday evening was fantastic! - density perturbations -> gravity -> galaxies? - there is a spherical halo around our home galaxy, the Milky Way, made up of regular matter and... dark matter? - dwarf galaxies, such as the Sagittarius Dwarf Elliptical Galaxy, orbit the MW - are these the mass/density perturbations that are shown in the models? - tidal tails, as they are called, result from galaxies or star clusters coming close to other mass densities, such as other galaxies or clusters. Palomar 5 is a great example of an object with very well formed tidal tails. We also heard from Cynthia Denny who talked about the Save Our State Parks initiative, which will create a trust fund for California State Parks. It was an evening very well spent! We had a great turn out for the San Jose Astronomical Association's general meeting last night. Board elections, a visit from a representative from the Astromical Society of the Pacific and the featured speaker were on the agenda. This was my first time at a meeting where board elections were held, and it went pretty quickly and smoothly. All the candidates recommended by the board were elected, and there we no write in candidates from the floor. Happy to report that yours truly is also now an elected member of the board. Next up was Brian Kruse, Lead Formal Educator from the Astronomical Society of the Pacific. He showed up to talk about the ASP's program called Project ASTRO. In his ten minute pitch, he discussed transcendence in astronomy, how it can be a lead in to other disciplines, such as math, other sciences and even literature. I'm a strong believer in that idea too. I tend to consider astronomy a crossroads of practically any other topic, but I like the idea of transcendence too. He discussed how misconceptions are easily created, and how Project ASTRO attempts to replace that with understanding by getting people, students to see concepts and getting some hands on experience rather than just hearing someone talk about concepts. Project ASTRO fosters this hands on learning by "linking professional and amateur astronomers with local educators". Sounds like a worthy and fun way to get involved, to share enthusiasm for astronomy. Next we got to the featured speaker, Rogelio Bernal Andreo who gave a unique and interesting talk about astrophotography from local skies. He had various images to show as examples of his work and work of others, illustrating different aspects of the art of astrophotography. Not sure which dark sky site he captured it from, but he even displayed a very real looking flying saucer! Rogelio wanted to be sure people knew that all you really need to do night time photography is a camera and a tripod. With that simple gear, you could make images of star trails. But nightscapes are better: think of a landscape, but at night. Time lapse images are interesting and easy to start with too. Some tips for the beginner with starter equipment include: make sure to have some landscape in the image, such as a foreground tree or hill; use landscape orientation rather than portrait; keep the main stuff of in the middle of the image; and watch out for dew, wind and your battery charge. Real astrophotography, at least what people usually think of, requires lots more equipment than a camera and tripod. But don't be fooled into thinking you need to spend five figures. Good images of shallow or deep sky objects can be created with equipment costing around a thousand bucks, or maybe not much more than that. But of course, the sky's the limit when it comes to gear; we all know that. Rogelio spoke a bit about the local sites he likes to visit to collect his data (in other words, take his raw images). Coe, Dinosaur Point and Montebello seemed to be favorites for various reasons. Setting a goal and appropriate planning are also important to make your time well spent. What was really interesting was Rogelio's take on what the photographer wants an image to convey in the end. This really was a serious hat tip to the art of astro-, or any kind of, photography. He showed lots of vanilla pictures of the Eiffel Tower. But to make it interesting, you need to do something interesting with that subject. Different perspectives, different colorings, a unique tilt of the image all can produce a unique image unlike others. It's all in the framing of the image, and so we also saw examples of some really cool variations of the Parisian landmark. For the more advanced folks in the crowd, Rogelio wrapped up with discussing some processing techniques and tools he uses or is familiar with. But that was beyond my level of attention. I was still nodding my head about his spot-on opinion of astrophotography as an art form. Good job, Rogelio, and thank you so much for the talk, for your time!